In what can only be a twist of fate “Washing Oiled Sea Otters” was published in the Wildlife Society Bulletin issue 38(1), March 24, 2012, the 23rd anniversary of the Exxon Valdez oil spill, and the roll out date of seaotters.com. The bottom line on this paper is that using some new tools and technology, we can wash sea otters and expect their coats to recover to normal water repellancy in ½ to 1/3 the time required in 1989. Washing Oiled Sea Otters has already resulted in serious reexamination of the equipment and methods for washing otters as well as some of the conclusions drawn from Exxon Valdez. In 1989 there were no facilities in Alaska to provide washing and care for oiled sea otters. Overall, 3,000–6,000 otters died, dozens waiting for care. Three hundred fifty six were picked up alive. Of these 196 (54%) were successfully washed and released, 123 (34%) died, and 37 (10%), most of which were pups, were deemed unlikely to survive in the wild and found homes in aquaria. But, the costs associated with washing and caring for oiled sea otters, the success of washing, and the apparent survival rates for rehabilitated sea otters, were harshly criticized. Whether that criticism was fair or not remains an open question. Beginning in 1991 California took a different road. The Office of Spill Prevention and Response (OSPR) was established within the California Department of Fish and Game (CDFG) and a commitment was made to provide “best achievable care” for all oiled wildlife. Plans were also drawn up for building or encumbering the use of wildlife care facilities all along the coast. The primary facility for washing oiled sea otters is the Marine Wildlife Veterinary Care and Research Center (MWVCRC) on the UC Santa Cruz Marine Science Campus (Long Marine Lab). The MWVCRC is part of the Oiled Wildlife Care Network (OWCN), managed by the UC Davis Wildlife Health Center, which covers all wildlife species for the entire state of California. From 2004-2008 the authors of Washing Oiled Sea Otters, who worked for CDFG, Monterey Bay Aquarium, UC Santa Cruz, and UC Davis, experimentally manipulated water type (salt–fresh) and temperature and monitored physiology, behavior, and thermal properties of otters to evaluate recovery from washing in the absence of oil. Otters were also dipped in canola oil, and one otter naturally oiled with Monterey formation crude oil, was washed using the same methods. Providing soft freshwater in recovery pools reduced recovery time substantially. Warming the freshwater appeared to offer additional benefits. Infrared thermography and subcutaneous temperature-sensitive passive integrated transponder tags were 2 new technologies that enhanced this research. The improved washing and care methods developed have the potential to save the lives of many more oiled sea otters and reduce the time required and the costs associated with washing. The actual costs of washing and rehabilitating the one naturally oiled sea otters was $5000, a far cry from the $40-80,000 apiece figure commonly claimed for washing oiled sea otters in Alaska in 1989. 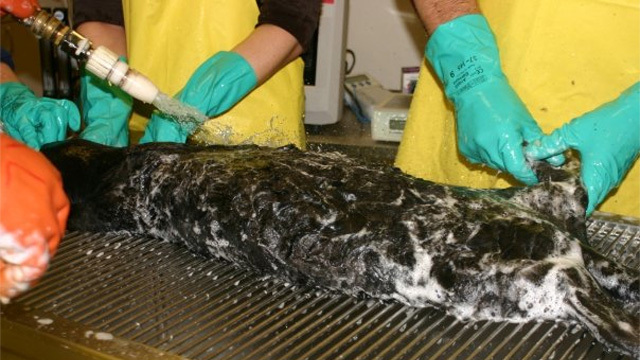 Washing Oiled Sea Otters is a “game changer” and it comes from the cooperation and collaboration of the member organizations of the Sea Otter Alliance.